Bricks are one of the most useful building materials used in construction works. It is important to know the types of bricks for understanding the masonry work properly. The types of bricks depend on their quality, strength, making process, motivation behind their utilizing etc. In this article, we will discuss types of bricks used for different criteria. Bricks are mainly classified into two general categories. 1. Unburnt Bricks & 2. Burnt Bricks. Unburnt bricks are also known as sun-dried bricks because they are dried by the heat coming from the sun. Nowadays these bricks are not used in construction due to their lower strength but if required they can be used for constructing temporary structures. As the name suggest, first class bricks are best bricks compared to others. Due to their high quality and greater strength, these bricks are most commonly used in construction work. The basic properties of first class bricks are given below. 2. Feature 2. Table molded. 3. Shape & Size 3. Standard and uniform (rectangular). 4. Surface & Edges 4. Sharp, smooth, square and straight. 5. Color 5. Uniform red or brown. 6. Maximum Water Absorbing 6. 15% of its self-weight when submerged in water for 24 hours. 8. Making Process 8. Burnt in kilns. 9. Use 9. Permanent and superior work. The quality of second class bricks is slightly lower than first class bricks. The basic properties of this type of bricks are given below. 4. Surface & Edges 4. Rough, uneven faces, may consist of hairline cracks. 5. Color 5. Uniform color. 6. Maximum Water Absorbing 6. 22% of its self-weight when submerged in water for 24 hours. 8. Making Process 8. Burnt in kilns and sometimes may be slightly over burnt. 9. Use 9. Used in internal walls. (Plaster or coating is required. 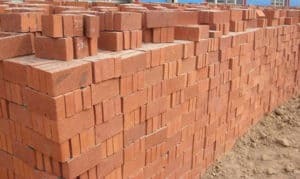 The quality and strength of third class bricks are too much low and they do not fulfill all the properties of good bricks. The basic properties of these bricks are given below. 2. Feature 2. Ground molded. 4. Surface & Edges 4. Irregular and distorted edges. 5. Color 5. Non-uniform and dark. 6. Maximum Water Absorbing 6. 25% of its self-weight when submerged in water for 24 hours. 9. Use 9. Used in temporary structures. first & second class bricks are usually table moulded not ground…. Very useful for civil engineering students and also for those in teaching profession. Does this classification for burnt Bricks correspond to BIS standard! 5/8 inch Stone Chip weight volume of 1ton = cft ? It’s been a great article and i actually wanted to know about these different types of bricks an its classification and i personally feel this article going to clear all of your doubts regarding to this topic so i am going to bookmark this for further reference.Thank You.